The Farewell Address - Be your best teacher! Usually by the last day of school, the students have mentally checked out and just waltz in to collect their report cards. You would think they would be satisfied with checking their grades online by now but that would ruin their perfect attendance so they all come, especially the freshman. By June 28th there isn’t much teaching to do so many students spend their day sitting in a hot classroom staring at their smart phones. So a few years ago I decided I would make their trek into school worthwhile – I give them a farewell address. sending them off feeling motivated for the summer. I always include meaningful quotes as I reflect on the close of the year. I share tidbits about how I became a teacher. I always try to explain to students that they don’t need to know who they will become as adults at 16 ( a valuable message for many of them to hear). I’ll share only part with you so not to bore you with the whole 35 minute speech. I highly recommend giving it a chance in your classrooms and making it a STAPLE of your end of year ritual. I welcome you to this farewell address today. First, I would like to celebrate the year we have had together. Think about how far you have come this year. Way back in September you entered the class by introducing yourself with a meme. From there you participated in Constitutional Conventions, Socratic Seminars, debates, mannequin challenges. You have spilled the tea, sang and danced, made pop up cards, told comedic jokes, painted murals, speed networked, sold an invention in the shark tank, crafted your own power point presentations, enjoyed the pumpkin and cookie challenges, and even visited the 9/11 memorial. Whew – It has been no ordinary junior year. I welcome you here today not only to reflect upon what an incredible year it has been, and all that you have accomplished this year in school, but also to encourage you to think about the future. The future. A black abyss far away for many of you. Well I have a sneak peak for you. It is a world without thesis statements. And Cornell note-taking outlines. And review sheets and AP tests. And SATs. And college applications. A world where you embark upon a limitless sea of potential. Where you get to discover who you are and maybe who you aren’t. But today at 16 or 17 know that you truly have limitless potential. The truth is the world that we’re living in – the one outside of high school and of college – is one filled with expectations from everyone. Parents, friends, keeping up with the Jones’s. Recessions. Joblessness. Student loans. Responsibilities. Bills. Laundry. Jobs. Marriage. Babies! But I truly believe with an optimistic attitude, even in the worst conditions, and in the worst moments, there is always a potential to see a light at the end of the tunnel. With this in mind I have compiled a few words of advice for you from many different sources. I hope this will give you some inspiration (for some of you it’s going to be perspiration) as you move on to senior year. I’ll start with Shakespeare- to thine own self be true. But I knew, since I was four, that teaching was going to be my destiny. But along the way I and the people around me started to find faults in my career path. When I got to middle and high school my teachers told me, you should be a lawyer, be an economist. Why would you be a teacher? You’ll make no money. So I started to think things over and began to question my career path as the years went on. But I made the best of it. I was a total nerd in high school, I participated in everything, but in my classrooms I never felt truly comfortable. We never debated, we never learned from a PowerPoint, or a clip from Youtube, we sat and listened to the teacher chalk and talk non stop for the whole year. I was bored. I knew that I would do it differently when I became a teacher. 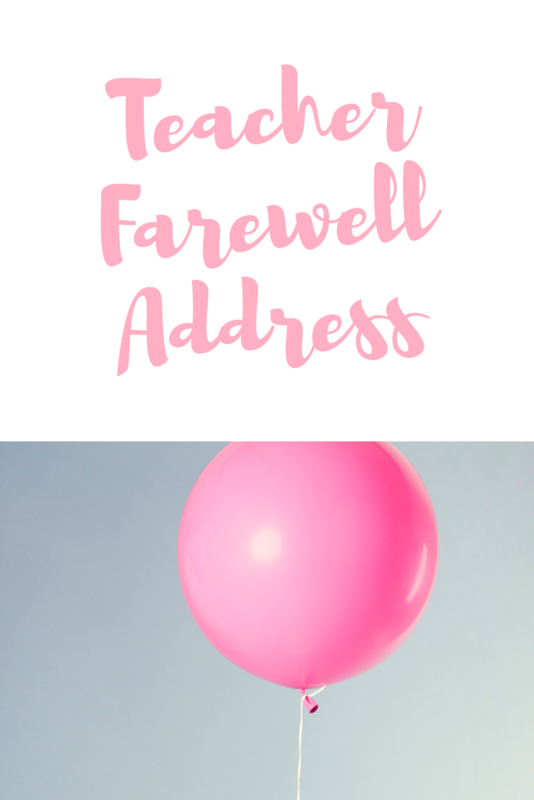 Have you tried giving a farewell address to your students? I’d love to hear your experiences as well.